What comes first the Pantone Color of the Year or the trend? The color experts at Pantone, who’s color system is the basis for all printing, take a look at the trends in the past year and spot commonalities. Not in your face trends, but little glimmers — accent colors, backgrounds, colors that repeat in patterns. 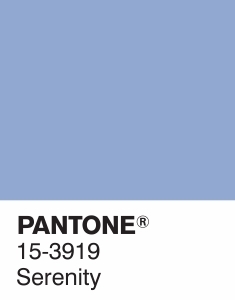 The Pantone color experts seek this color out as the next big thing … And it is, because they say that it is. 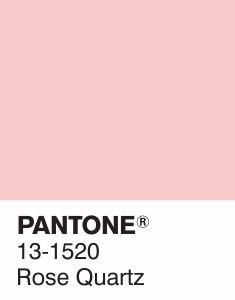 This year we were given the combo of two colors, Pantone’s Rose Quartz (13-1520) and Serenity (15-3919). Separately, they kinda look like Grandma’s bathroom tile. Together, they’re kinda nice. Look at Pantone getting all up in it! Their words give the hombre trend over the last couple years a deeper meaning. Expect to see more of it! Singly, these muted colors have been very popular in the wedding world over the last few years. Pantone is suggesting that we alter our approach to color usage and not only pair, but combine the two. Anything excite you about the Pantone dynamic duo? What do you think of the combo?